“While driving to JFK airport I noticed a very odd looking ariel craft moving in my direction across the sky I stopped to observe closer as a past almost over head there was no sound as if it was floating & had appendages. On September 29, 2018, a person was watching on TV, The Fox News Saturday Morning Show. During a interview, he noticed a black UFO on the screen. This object was flying over Washington, USA. What is it? “I saw it fly above my head and just had time to pick up my 90x zoom cam corder to film. On September 27, 2018, live cam caught images of a strange glowing UFO passing near ISS. On September 26, 2018, an ufologist found a strange v-shaped UFO on Google Earth in Antarctica. What is it? An alien spacecraft or a stealth craft? “A strange V-shaped object has been spotted on Google Earth and it looks like some sort of a V-shaped UFO or stealth craft being launched in Antarctica, a smoke trail is visible behind the 10 meters long craft. “I was made photo of local church Jasenak near Smederevo, Serbia. During photo with my Samsung S8 cell phone not see anything spouses. After taking a photo I spotted something like UFO. You can see object in left upper corner. Because my cell phone have very good camera with extended exposition, on picture I saw something that not see in first look. About place : Church Jasenak is special healing place on hill with endemic creatures. This object hovered right above this place. On September 26, 2018, a man and his wife saw two orbs flying over Nanaimo, British Columbia, Canada. On September 25, 2018, at 11:06, LASCO C3 onboard the SOHO caught pictures of strange object flying near Earth’s Sun. On May 27, 2018, a person found two mysterious long tunnels on the Moon. Is it a proof that aliens lived here? On September 22, 2018, an automobilist was driving down 157 thu Casyville, Illinois. Suddenly, he saw an impressive black rectangular-shaped UFO. On September 24, 2018, a witness was in a hotel in Sydney, Australia. He took a picture from his window. Later, he noticed a bright UFO on it. “I took this picture from my Window at a hotel I was staying at in Sydney Australia. “Happened during sightseeing of Pisa in Italy. Did not see the craft when we were there, only sounds there were few quiet people speaking around. Noticed green light on pictures that got my attention. After zooming in on one of the pictures you can clearly see green triangle light formation. Looks like the object was stationary. On September 23, 2018, an amateur astronomer living in Swansea, Wales, was taking photos of the moon. Then, he saw UFO coming from the moon. What is it? “1. I was in my garden taking photos of the moon. 4. I didn't see any detail on it as i was far away and happened really quickly, no more than 5 seconds. It moved quickly and in a diagonal direction from the left side of the moon in a straight line, then it disappeared. 5. I felt really excited when i saw it and was able to take a photo immediately. When i studied the picture and was unable to identify what it was i felt really elated at the prospect that it could be a UFO. On September 23, 2018, the famous ufologist Scott C. Waring found an alien face on asteroid Ryugu on a picture caught by Japanese probe. “I found a large alien face on the astroid called Ryugu today. This is an astroid that is currently being examined by two Japanese mini rovers, so hopefully we will get some more great photos to search over. The face is wearing a hat covering tis head and a mask covering its mouth and chin area. The eye, cheek, forehead area are all visible. The alien has an extended cranium, much like many have come to expect from some species of aliens. I believe the hat and mask on the person is a cultural tradition, much like a muslim woman covering up her face and head...and yes, this does appear to be a female. The astroid is 3,000-foot-wide (900 meters) across, so this head would be less than 1/7 the diameter...so the head would be about 128.57 meters across. 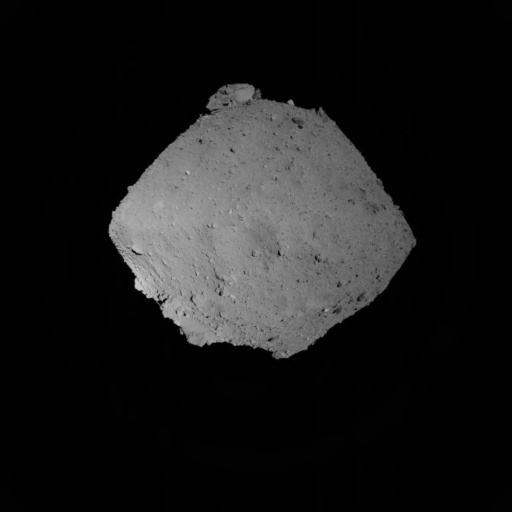 Also the current value of Ryugu for mining purposes is speculated to be US$82.76 billion. “Hi, I saw the UFO sightings page and people who have had encounters on the website and thought this would be good to add. I was joining my husband along a business trip to Exeter, New Hampshire this week. We love walking at night everywhere we go and just loved the charm of Exeter, so we took a stroll around 11-midnight on 9/9-10/2018. As we were taking some photos of the historic downtown buildings, we noticed what looked extremely similar to the Phoenix lights in the sky. We captured some photos and tried to reason them out, but there are just too many local stories and reasons as to why it is highly probable that what we saw was a UFO. After being a bit freaked out about what we saw, we learned about the famous Exeter incident in 1965 and the local UFO sightings that have happened in Exeter since the 1960s. They even have a UFO festival every year. It was just so strange that we saw this, not knowing about the alien and UFO encounters in this town until after. On September 16, 2018, a black cigar-shaped UFO was photographed over a volcano located near Pasto, in Colombia. I decided to take a picture of the moon and got this in the picture. By watching the NASA live space station cam on September 20, 2018, Scott C. Waring, a UFO hunter, saw an unidentified light. On September 18, 2018, a strange reptilian face was found on Mars (Sol 624) by Spirit rover. What the hell is it? On September 16, 2018, a witness living in Skokie, Illinois, spotted an unidentified green light flying in the sky. What is it? “From 6:38 to 7:49 PM I was taking a walk in my neighborhood just south of the Jane Stenson Elementary School in Skokie. I log all of my workouts, so these times are accurate. At approximately 7:40 PM I was looking to the southeast and saw a bobbing emerald green circular light in the sky, estimated to be above the north end of the Skokie Swift Commuter Lot by the intersection of Suffield Court and Gross Point Road in Skokie. It looked just like a green stoplight, making the same jerky motions in the sky as a fishing bobber. I was curious, and I ended up running back to my house to tell my partner about the light in the sky. At about 7:50 PM, after I logged my workout, he came outside with me in the front yard to observe the light, and we were facing southeast. He went back inside after about 2 minutes and told me to not “get abducted” in a sarcastic way. I went inside with him because I felt awkward staring at the sky in my front yard with cars driving by. I walked out my back door into the backyard to continue to watch the light. My partner was not interested in continuing to watch with me and stayed inside on his computer. I stayed outside to watch the circular green light bob around in the sky. Approximately 25 minutes later the circular light started darting around quickly, making jerky movements with much more distance and speed. At that point I became frightened and went inside and called my partner to come outside to watch the light with me again. I told him that drones don’t move like that, or that fast. He stayed outside with me in the backyard for another couple of minutes to watch the light, and calmed me down a bit. I texted one of my non-judgmental friends about what I was seeing, as I was watching outside. I tried to take a couple of photos on my iPhone, but the photos just show a pin dot of green light and did not accurately capture what I was seeing with my eyes. I watched the light in the backyard from about 7:55 PM until 9:20 PM. At that point I could not stand to get any more mosquito bites, so I went inside the house to take my evening shower and put on some calamine lotion. At 9:50 PM, after I was done with my shower and dressed for bed, I went back outside, and the light was still visible in the same place. I watched for 2 minutes and went back inside to get on my computer and avoid being bitten by any more mosquitos. I have been going back outside once every 20 minutes to check and see if the light is still out there, staying for 2 minutes each time to avoid getting bit by more mosquitoes. As I am writing this summary, it is now 11:15 PM on 9-16-2018 and the light is still visible, but has moved, from my point of view from the southeast, now to due east. The light is now approximately hanging and bobbing overhead in between the ComEd Skokie Power Substation and the Skatium Ice Arena. I am going to head to sleep now as I have to get up to go to work in the morning. As strange as it is, I’ve been watching it for a few hours and should go to bed. On September 18, 2018, during sunset, a weird bright square-shaped UFO is appeared over Merrimack, New Hamshire, USA. “I was at the Merrimack premium outlets, in the first parking lot (near the mall entrance at the top of the hill). I was walking into the mall, and was currently in the parking lot. The direction that I was facing in the parking lot had maybe, 10 cars total. It was very empty. I did not ever notice the object - I quickly took the photo because I thought the sunset looked pretty, but didn't want to draw attention to myself taking photos of a sunset. I very quickly snapped the picture, without noticing anything. I have no idea how it moved, because I only have 1 photo. I was very freaked out when I saw the image. I had taken other pictures of the sky that night (different parking lot - yes I like sunsets a lot haha) and did not see anything unusual. The picture was a direct image - there is not glass or anything reflective near the image. Like I said, even the parking lot had almost no cars, plus it was very dark, so not much shiny stuff around. I did not edit this photo in any way. The only possible explanation that would make any sense is that my camera had some weird malfunction that created that impression on the image, but I don't think that is the case since its always worked fine (Iphone 6 camera). One other point is that the parking lot lights do not have the same pattern are the anomaly, so I do not believe that was creating any reflection/glare/impression on the image. Also, I don't know if it's a cloud or a lens flare, but there seems to be a sonic-type wave surrounding the object, as if it's moving very fast or effecting the air around it. As a sidenote, I am very aware that it looks like the Microsoft logo. I think it's just a coincidence, but to be clear: there is no microsoft store or sign at this mall. Just to get that one out of the way. On September 18, 2018, a dark flying saucer was caught during a road trip over Millanocket, Maine. What is it? “My the attached photo via text message, from my sister-in-law and her boyfriend on Tuesday September 18, 2018. They were on a road trip near Millinocket Maine and unware of the object shown in the background sky over boyfriend's head. Photo was taken on Tuesday September 18th at 5:01 p.m. US EDT. On April 27, 2018, a mysterious spherical-shaped UFO was spotted over Lancaster, Great Britain. It moving fast and a witness caught an incredible picture. On September 16, 2018, a witness took picture of rainbow in Frankfort, Kentucky. On image, he found something of very strange. On August 31, 2018, a man was driving on a road in the north of Webb City, Missouri. He caught pictures of clouds. Later, he noticed a flying saucer on it. On September 16, 2018, a witness living in Fowlerville, Michigan, saw an oval-shaped UFO flying over the sky. It emitted his own light. On September 14, 2018, at 10PM, an automobilism was driving on a road in Stillwater, Minnesota. Suddenly, the witness and his wife saw an incredible UFO in the sky. On September 2, 2018, a person living in New York found three weird UFO near Sutton Park, Dublin, with Google Maps. What is it about? On September 14, 2018, a witness has photographed a yellow UFO over Margate Beach, Kent, UK. He didn’t see it with naked eye. On September 14, 2018, a witness was hiking in the mountains in Alto, New Mexico when he noticed a weird UFO flying in the blue sky. What is it? 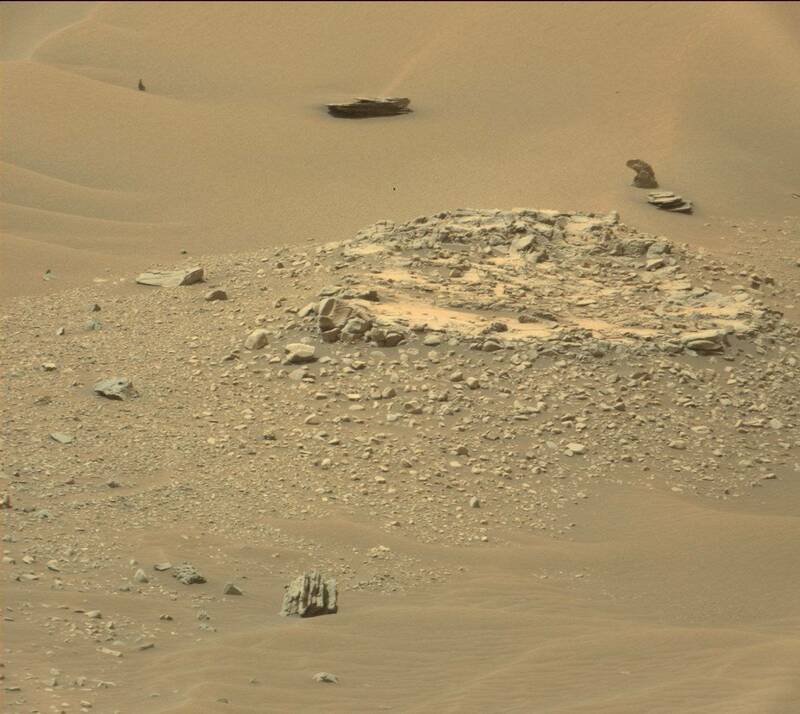 On September 14, 2018, ufologist Scott C. Waring has found a bottle on Mars (Sol 2168). Is it a proof that aliens lived on this planet? On September 14, 2018, a trail cameras placed out outside a home has filmed a strange small craft. What is it? Is it a rod? UFO? “I place out 2 wildlife trail cameras each night to film the local wildlife in my garden. My trail cameras work in infrared and take a 3 photo burst followed by a 3 min video. Last evening they took the attached 3 pictures which are numbered in order of sequence that the camera took them. You will note that they are date and time stamped. The object had to be of sufficient size, heat and density to trigger the camera as insects, moths etc do not set them off. If you click on the pictures in slideshow you will see the trajectory of the object. The video which was then created after the 3 photo burst had no images in it as the object had already gone. On September 12, 2018, a witness was visiting Grand Canyon, in Arizona. He took pictures and noticed 2 UFO later. On November 1st, 2004, a witness has encountered a pitch-black humanoid figure in Morgantown, West Virginia, USA. “It was approximately 9PM, and I was in my bed watching television. Directly above my bed are three windows with 12″x”12 glass panels. The television was to the left of my bed. Suddenly, my attention was drawn to the floor approximately four feet from the desk my television was on. What I saw was a beam moving very quickly in small circles in one concentrated spot on my floor. The circle motions it made were not perfect, the best I can describe them as were “wobbly circles”. The beam was solid, pure solid light and approximately an inch wide…it was fairly thin. The color was a pure white with somewhat of a blueish tinge around the outside of the beam. The beam itself was bright, but did not seem to emit any light beyond its edges. My room was NOT filled with light, only this beam. I was able to watch for about 5 seconds before I fled my room in a state of total panic. I was not able to tell exactly which of the three windows the beam was aimed through, but assuming that had it beamed straight into my room onto the wall parallel it would be 90 degrees, I would estimate that it hit my floor at a diagonal angle of about 60 degrees. When I got downstairs, I looked outside to see any evidence of a craft (I have never to my knowledge witnessed a UFO) and there was none. There were no aircraft of any kind besides high-flying commercial planes. I did not tell anyone in my house about what I had seen. I wasn’t sure if my mind was playing tricks on me or what had actually happened, but I saw something. When I checked the area later, there was no evidence whatesoever of the beam having ever touched my floor. In 2017, a truck driver revided a bizarre wolf-horse creature somewhere in South America. What is it? “This incredible footage shows a kind-hearted lorry driver in South America reviving a strange creature suffering from extreme dehydration. On September 11, 2018, three bright stationary UFO in perfect triangle shaped are appeared over Great Lakes, Illinois. After 3 minutes, one of them just disappeared. A cyclist has caught a weird picture while he was riding a bike on a road in Baja California, Mexico. In front of him, there was a sort of ‘giant worm’. On June 30, 1990, alien entities have paralized multiple witnesses in Bel Air, Harford County, Maryland. “I became conscious from sleep but was paralyzed completely. I could feel pressure all over my physical body as if I were being held in place and held down, even on a molecular level. There was a sound all around that was reminiscent of the sound a baby’s heart makes in its mother’s womb… very loud in my ears and it was externally audible. It felt like my life force was being sucked up, and in my mind’s eye I saw 3 figures sitting above me and siphoning my energy somehow. I became very angry that my free will had been attacked. I willed myself to fend them off by saying over and over that they had no right and they would be blown to oblivion. (prayer did not help at all, it was only when I made it known that I was the ONLY authority over myself that they stopped and ran away) All of a sudden, my eyes clicked open and the pressure was relieved. But then there were heavy footsteps on my roof and the doors of my armoire flew open and some items flew out of it onto the floor. I heard noise in the tree outside my window and I went to look outside to see 3 figures heading in the direction of Main street (I lived across from St Margaret’s church at the time). Needless to say I was freaked out and could not sleep anymore that night. On September 10, 2018, a famous alien hunter found a weird face with helmet and beard on Mars. Is it real? “Look carefully at the red circle in the above photo. Do you see what I see? Can you see the the face in stone? It has a helmet, long hair, long nose, eyebrows, mouth, beard and mustache. It looks like the face of an early Roman era as you see in the photo I placed beside it. There was also two other faces. One was a doll like face of a little girls head and hair. The other was just a white face which set it apart from the dark surrounding area. On August 31, 2018, three weird UFO lights recorded over Albany, on night, in the state of New York. A witness has spotted a black UFO over the city of El Reno, Oklahoma, on Google Maps. This object is hard to see. Maybe it was at high altitude or it was really tiny. On September 9, 2018, during sunset a huge UFO was caught over Reykjavik, Iceland. What is it? “This UFO was caught just today and was seen during sunset over Iceland. The UFO measures over a mile across has a shape of large disk, AKA flying saucer. This is a fantastic video of the UFO and it appears he didn't see the craft till viewing the video at home, otherwise he probably would have focused in it a lot more. I often say its easiest to record a UFO during sunset, because the angle of the setting sun, the UFO and the eyewitness makes a perfect triangle which causes the cloaked UFO to be revealed...for a few minutes only. This is one beautiful alien craft. On July 10, 2017, at 5:15 AM, a witness was driving in highway 62 in Parrish, Manatee County, when a strange creature has crossed the road. “Monday July 10 2017 5:15AM. While driving home from an all night fishing trip at Tampa Bay, we were about 2 miles outside of Parrish FL. There was a car ahead of us & we were about 10 car lengths behind.This creature waited for the car ahead of us to pass and ran across between our two cars. It was running upright on two legs. It was huge & fast. It didn't have the shoulder motion that a human has when they run. Manatee Sheriff contacted. The shoulders didn't swing or move when it ran, very short or no neck.Only seen the feet hit twice & it was in the grass & gone. On September 8, 2018, a weird UFO was shot during a fireworks over Hudson Falls, in the state of New York. What is it? On August 28, 2018, a witness saw approximately 5-7 bright circular orbs flying over Phoenix, Arizona. On September 4, 2018, multiple unidentified lights in circular formation flying over Victoria, British Columbia. On September 5, 2018, a mysterious sea creature found washed up on a beach in County Wexford, in southeastern Ireland. On September 4, 2018, the ufologist Scott C. Waring has discovered an ancient yatch on Mars (Sol 969) surface in NASA photo. “How strange it must be to think of find a boat on Mars, and yet, here it is right before us. Its the perfect side view of a typical luxury yacht that one might see in the Florida Keys. On August 31, 2018, in the morning, an automobiliste has filmed an incredible incandescent triangular-shaped UFO over El Paso, Texas.